American Education Week is celebrated November 12-16 this year. One day of the week is set aside as Invite Parents to School Day, also known as National Parent Involvement Day. This annual event offers the opportunity to spotlight the importance of parent involvement. Parent involvement occurs in many different forms both in school and at home. Research verifies that students whose parents are involved are more likely to be successful both academically and socially. As educators, it is in our best interest to encourage and promote parent involvement in our schools. 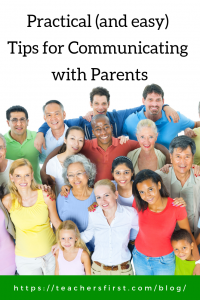 One of TeachersFirst’s recent bi-weekly Twitter chats offered many ideas and suggestions for parent communication. The archive of the chat contains the complete hour-long discussion, including many thoughtful tips and technology ideas for embracing parents in your classroom. Class website or blog – use your website or blog to share homework assignments, important events, pictures of student projects, and more. Think of your site as the window into your classroom. Be consistent with updating information so that parents know that it is a reliable resource for the very latest classroom events. Don’t forget to include contact information for parents to reach out to you. Webnode (TeachersFirst review) is a free website maker that includes many free tools and templates for designing professional-looking websites in minutes. Edublogs (TeachersFirst review) includes blogging tools for teachers, students, and entire campuses. This ad-free and student safe environment is perfect for use with all grade levels. ClassDojo (TeachersFirst review) connects schools with home through sharing student portfolios, classroom announcements, and videos. One major feature of this site is the automatic creation of student behavior reports with weekly summaries emailed to parents. Remind (TeachersFirst review) is a safe and secure text and email service. Use Remind to send reminders of upcoming field trips, project due dates, conferences, and more. Bloomz (TeachersFirst review) is a tool for sharing classroom communication and coordination. It also includes features to sign up for conference times and volunteer opportunities. Parents who don’t sign up receive email updates. Edmodo (TeachersFirst review) is an all-in-one classroom tool that includes a mobile app for parent updates. Use Edmodo to find and share lessons, grade assignments, and post your calendar of events. Google Classroom (OK2Ask archived session) makes it easy to manage your entire classroom from anywhere. Use Google Classroom to email parents and caregivers directly with a summary of their student’s work. Twitter (TeachersFirst review) is an excellent way to communicate with parents and the community. Create a personal hashtag for your classroom to make it easy to find all Tweets. Encourage parents and students to share ideas, pictures, and videos of class events, and send reminders on Twitter. Check out this TeachersFirst Special Topics page with several different resources and suggestions for using Twitter in the classroom. Padlet (TeachersFirst review) may at first seem like an unlikely communication tool; however, it offers many different features to involve parents in your classroom. When sharing Padlets with student-created projects, turn on the commenting feature and encourage parents to share their thoughts and congratulations on student accomplishments. Create a Padlet just for parents that includes parent information and resources. Take a look at this Padlet created just for parents that shares videos to review with students, online textbook logins, and more. Encouraging strong parent participation in the classroom and at home is a win/win situation for everyone. Take advantage of the many free and easy tools to open the window to your class; you may enjoy the fresh air coming in! Do you have a favorite communication tip or tool? Share your ideas in the comments below; we would love to hear them. Next Next post: The New Black Friday: Listen Up!